I will continue with the Moon through the Houses blog posts but wanted to add this post in, in-between. So you can see that the Sun correlates with Ego, right? And it represents our need for recognition and how one goes about getting that recognition or attention or acknowledgement of the “self”. The Moon, on the other hand, represents subliminal or less conscious patterns in the psyche. It’s not ego that we express outwardly like the Sun but rather how you “feel” inwardly. Sometimes it is instinctual and not conscious at all–meaning that it is the part of a person that there are no words to express, especially for someone who is not in touch with their feeling nature at all. And let’s face it, lots of people have shut that down purposefully. Look at soldiers, they are trained to shut that down. People will often deny or shove down the Moon energy but it shows in the world anyway. People see the traits of your Moon energy whether you deny them or not. People will project their Moon energy too–attracting other people who will carry that energy for them. Your Moon energy is your emotional response–your instinctual or “gut” responses. 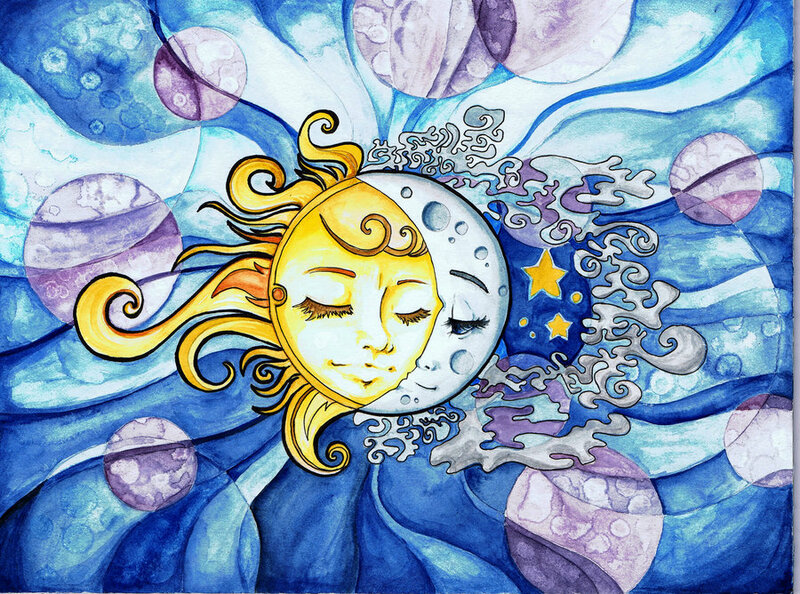 Moon and Sun are like heart and head respectively. That’s one way of seeing it. We could also say this about the Sun/Moon contrast: The Sun dominates it’s environment. The Moon’s way differs; it adjusts and responds. Luna is sensitive to surroundings, melding into them rather than trying to shape or resist like the Sun does. When I was a child, my mother and father would advise me to stop being so sensitive. They, of course, knew nothing of astrology. If they did, they’d have understood just how difficult their criticisms of my nature and chastising me to “develop a tougher skin” wasn’t accomplished so easily with someone of my nature. Neptune is sandwiched between my Sun and Moon and all in the same sign and that alone is an astrological signature of a “sensitive”. But they were giving me advice that they thought was helpful I’m sure even though I felt very misunderstood. The Moon is Heart and Pure Emotion and more more fluid than the Sun. The Sun, you see, tries to screen out emotion in order to guard the ego but if a person has a Sun and Moon close this is more difficult to do (in my own case, the Moon is balsamic to the Sun). The Moon springs from the unconscious and can feel overwhelmed. There’s so much more that can be said and will be said through my upcoming Moon class…but that’s a little bit of the difference between the Sun and the Moon. What if the Sun and the Moon are in the same sign? The archetype of the Sun sign and the Moon sign if they are in the same zodiac sign, are the same but they manifest differently in the ways just described.